If an RQ audit shows a question that is really open (whether it’s one that has never been closed, or one that that’s been closed, improved, and reopened), the “correct” action (the one that lets you pass the audit) should be reopen. The audits should not require the reviewer to vote to close (or leave closed) questions that five users (or one über-user) have chosen to reopen. P.S. Why does it say “If you’re unable to fix these problems by Editing, you should Close such questions.” in the Reopen Queue? It should say “…, you should leave such questions Closed.” or “…, you should vote Leave Closed on such questions.” And why is it still saying “Stop! Look and Listen.” when there’s no audio? 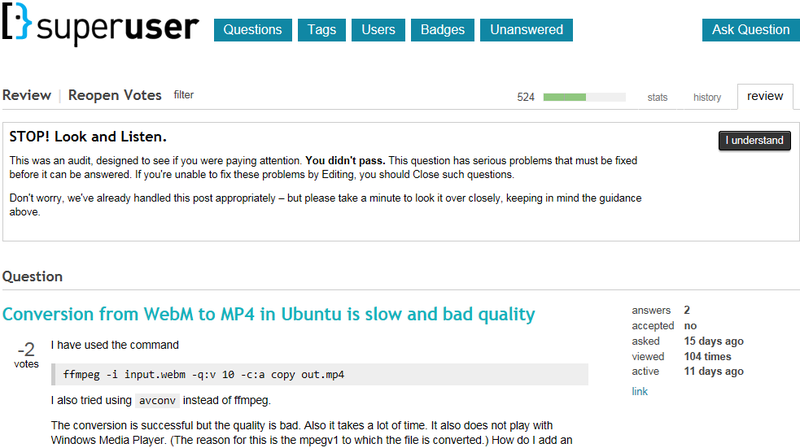 Browse other questions tagged bug review-audits . How are questions for reopen audits chosen? Can we exclude some? Why have the review audits not been fixed? Should we look up existing answers when reviewing?